White Wolf : Wolves Howling For A 2016 New Year Message and Beyond. 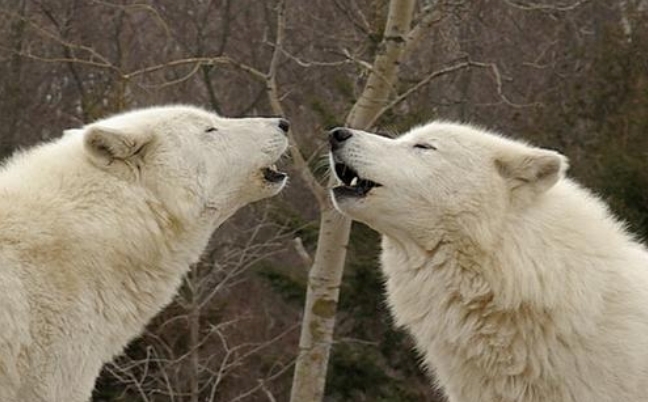 Wolves Howling For A 2016 New Year Message and Beyond. The United Nations Environment Program estimates that 150 to 200 species go extinct every day, which is about 10 to 100 times the "background," or natural, rate of extinction. One problem facing endangered species, particularly in developing countries, is poaching. Driven in part by the demand for animal parts in traditional medicine cures in parts of Asia, poaching (and capture of animals for the pet trade) has only increased — dramatically — in the past decade. But humans are animals who come from a world replete with other creatures and forms of life. Even now, surrounded as many of you are by urban centers, devoid of forests and most wildlife, people depend on plants and animals for survival. Ultimately the loss of biodiversity will hurt you, as you, dear humans, are part of the web of life. Each species serves a specific function that can't be wholly replaced if one goes extinct, leading to a less productive ecosystem which ultimately provides fewer benefits for humans. To avert the worst effects of global warming, humans would need to quickly find alternative fuel sources — look back to what's been provided to you and harness the sun or the wind or heat from the Earth. The worst effects of warming can be seen in the Arctic and Antarctic, due to a phenomenon called polar amplification. Many areas throughout the Arctic have already warmed by 3 degrees Fahrenheit (1.7 degrees Celsius) over the last 30 years, heating up much more quickly than the rest of the world and acting as harbingers of things to come. PROTECT WILDLIFE AND OF COURSE PROTECT WOLVES. THEY ARE ESSENTIAL. Responses to "Wolves Howling For A 2016 New Year Message and Beyond."